Run a Code Club in your local library! Code Club have thousands of amazing clubs running around the UK. The majority of these take place in schools, run by our volunteers with the help of teachers. However, there are now growing numbers of Code Clubs being set up in public venues such as libraries, which serve as excellent locations because they are open on weekends (for extra busy volunteers who can’t fit Code Club in during the week), and they are open to a wide range of children from across the community. 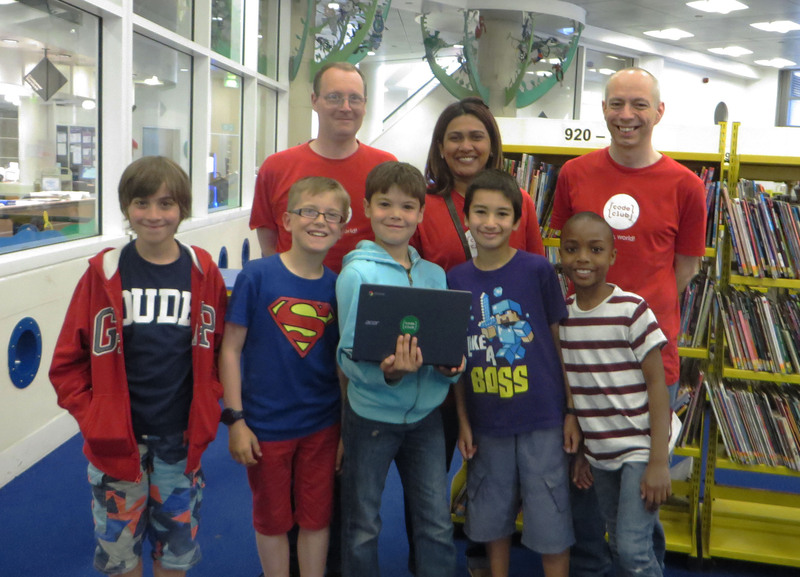 We wanted to profile one of our library-based clubs to show just how easy and versatile these venues can be for running a Code Club, so we spoke to Paul Sinnett, who runs a Code Club in his local library in Croydon alongside fellow volunteers Saleha Salahudin and Marc Grossman. Why did you decide to set up a Code Club? I’d been working for many years in the video games industry. We’d always had a hard time (along with the rest of the IT sector) attracting new game programmers. A few years ago I decided to start teaching part time at London South Bank University and it was only then that I discovered the widespread lack of exposure to programming skills in schools. As a student in the 80’s I developed my programming skills on the government sponsored BBC micro and other home computers of the time. And I had grown up naively assuming that these educational programmes had continued. But in each year’s cohort I had only one or two students with previous experience in programming. Our university runs a yearly game related conference, and it was at one of these conferences that the idea of teaching game programming to primary school children first came up. It was about this time that Eric Schmidt made a call to action to the government to address the need for a Computer Science curriculum in UK schools; the Livingstone-Hope skills report was finally gaining traction; I had developed an interest in visual programming as a way to introduce programming to beginners; and, I heard about Code Club for the first time. All of the pieces came together very quickly. For me it was a mixture of learning how to teach programming to beginners, giving today’s children some of the experiences I had grown up, and supplying my university course with students already able to program. My first club was an after school club at Heaver’s Farm primary school. That started at the beginning of 2013 and ran for a couple of terms. The teacher there was enthusiastic and was able to run the club himself after that. But it became increasingly awkward for me to arrange work and club times particularly when I was commuting to Brighton. Fortunately, Code Club announced the option to run clubs from public spaces such as libraries and in June of 2013 I started my second club at Croydon Central Library. This club runs every week on Saturday morning from 9.30 to 10.30. Through Croydon’s growing tech scene, I got to know several other local Code Club volunteers. Two of those, Marc, and Saleha now help me run the library club every Saturday. We started with 1 child and quickly grew to about a dozen. Most of our sign ups have come through the Code Club web site, but we also get new children through word of mouth and visitors to the Tech City meetings. We now have over 50 children registered with the club, although they don’t all attend every week, some are regulars and others just drop in when they are free. We have 8 desktop computers allocated in the library and access to the wifi network. We usually have three laptops between us volunteers and many of the children bring their own. What has having a Code Club brought to the library? The club has brought a lot of children to the library at an otherwise quiet period of the day. But crucially, from the point of view of the staff I have spoken to, we have brought in a lot of boys that are normally under-represented in the library. What tips would you give to any other libraries thinking of setting up a Code Club? In the first instance, the Code Club website is a good resource for finding a local volunteer. I’d definitely recommend Saturday as the day to run the club as many more IT professionals will be free on that day. If you have someone interested but wants to know a bit more about it before committing to starting a club, please feel free to suggest that they visit us at the Croydon Central Library. I think my favourite moments at the club are when the children show a genuine interest in gaining a deeper understanding of maths or geometry. One child begged me to tell them how many degrees it takes to go all the way around. Another worked out how many doublings it would take to get to 2048. Want to follow the example of Croydon Library and set up a Code Club in your library? Email us on hello@codeclub.org.uk to find out more. At Code Club, we know that one of the awesome ways to inspire children to be excited about programming is to let them get their hands on hardware with which they can experiment. We also know this hardware doesn’t grow on trees, so we’ve got a solution – the crowdfunding platform Hubbub. Hi Christina! First of all, could you explain a bit about what Hubbub offers our volunteers, and how crowdfunding works? Hi Code Club! Certainly. Hubbub offers volunteers and schools an exciting way to raise extra funds for their Code Clubs by crowdfunding. Crowdfunding is a great way to bring communities together for a good cause! It works by different amounts of money being donated by lots of people to reach a target in a set deadline. Volunteers can create a crowdfunding project explaining what they’d like funds for (they may need more Raspberry Pis for their classes, for example). A moderator will look at the page to make sure it’s just right before going live. Volunteers and the school can then promote the crowdfunding campaign to the community. If the target is met, the school will receive all the funds to carry out the project. If the target isn’t met, no money is exchanged – donors keep their money! The volunteer/school can continue updating donors during and after the project so they know how their donation has benefitted each Code Club. To get started on an inspiring project, head over to the Create page on Code Club’s crowdfunding site. Do you have any tips on how our volunteers can promote their campaigns or encourage their school/ local communities to donate? People are often excited to support volunteers who are bringing technology to children! The key thing is to not be afraid to share your project with the school you’re supporting or to ask for donations. I would recommend that volunteers get in touch with the head teacher, teachers and PTA at the school they are helping and explain their campaign. Ask if the campaign can be included in the school newsletter, if teachers can pass it on to parents and ask them for donations. If you’re raising £300 – that would mean every parent in a class of 30 could donate £10 to reach your target which then benefits the whole class with an even better Code Club experience! PTAs are also great to contact and always looking for better ways to fund initiatives that benefit pupils. Check out our handy guide for more crowdfunding advice. How much should our volunteers be aiming to raise? There’s no limit to how much a volunteer can raise but the higher the target, the more you have to promote! Don’t set a target higher than what you actually need: a few hundred pounds could be easier for a small community project. That said, the sky’s the limit with crowdfunding! What happens if a campaign doesn’t get funded? If a campaign doesn’t reach its target, don’t worry! Donations will only ever leave donors’ accounts if the minimum target is met. Do you have any great examples of successful ed tech crowdfunding campaigns? Of course. Charlotte from High Beech Primary School raised an amazing £2,198 from 80 supporters to upgrade all the technology equipment at her school. Take a look at her campaign here. What if our volunteers have extra questions, or need help in setting up their Hubbub campaign? If volunteers have any questions about getting involved in crowdfunding for their Code Club, I’d be happy to help! Simply pop an email to christina.pashialis@hubbub.net. We have a very special guest blog post this week from Harry James. 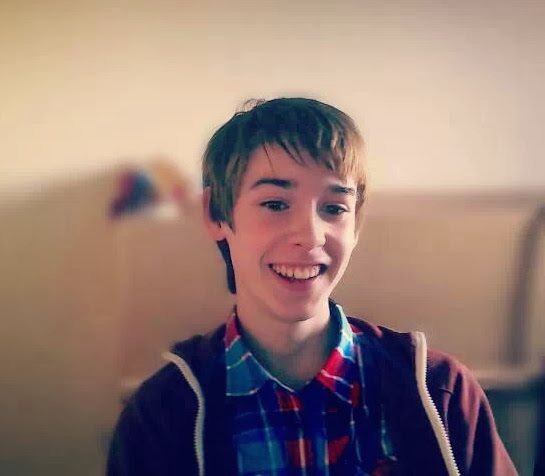 He is 15 years old and attends school at Whitley Bay High School. A keen coder, last week Harry completed his work experience with Ignite at Campus North. Read what Harry has to say about the importance of having Code Clubs in schools and how programming can enhance creativity amongst an already technology-driven generation. Coding has been around for many years now but it’s only been recently that schools in the UK have adopted the change and made programming part of the curriculum. In the modern age, programming should be a compulsory subject for students to learn – even if they don’t use it towards their career in the future, the way it makes you think will certainly aid them in education. Programming has a host of benefits; problem solving, mathematics, languages and more. Just these few examples show how useful learning a computer language from a young age is for a student. Kids of the modern age love technology and are are full of creativity; any parent will know that they just love making things. With over ¼ of children aged 3-4 using a tablet computer, it should most definitely be taught to kids how they can develop applications and programs for the computers. One problem faced by many adults is that they don’t understand the technology of this day – it’s growing incredibly quickly. An Ofcom study found that the majority of 6 year olds knew more about technology than a 45-year old adult. This is where Code Club comes in. At Code Club, there is a range of volunteers who know how to code and are able to teach kids how to program. Code Club is open to anyone aged 9-11 and there are over 2500 clubs in the UK alone! The mentors are able to teach kids all the fundamentals of programming where the kids can then go on to build whatever is in their imagination. If they get stuck on the way, the students can discuss their problems with each other or talk to one of the mentors. Programming isn’t something that should be taught towards adulthood years – it should be taught from a young age because it makes it easier to understand and introduces a wide skillset to the child, making many other school subjects a whole lot easier. If you haven’t already, be sure to check out the Code Club site and take a look at all of the resources on offer to students. They make coding fun, informative and exciting so together, let’s try to expand our community to as many places as possible. If you know anyone who would be interested, be sure to let them know! After all, we rely on people like you reading this to make a difference and get kids coding!